The Support Table Extension gives extra support for long work pieces. Shopsmith's support table helps you handle long or wide boards alone -- even serves double duty as a roller stand. 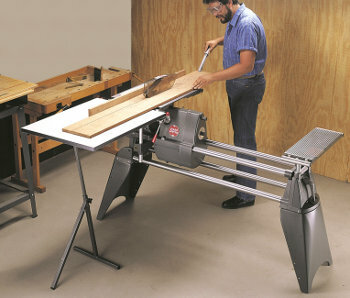 Support table helps you handle wide or long workpieces by yourself with added safety and convenience. Just attach this support table to the infeed or outfeed end of your Mark 7 or Mark V worktable in a matter of seconds when you need to handle long boards or wide panels by yourself. The opposite end of the table is then supported by a leg that telescopes so you can match the work table height... then locks at the twist of a knob. The table tilts in unison with your Mark 7 or Mark V worktable. The generous 24"w X 32"d X 1" thick top is covered with a low friction, easy-to-clean laminate and features two relief slots in the surface that allow your miter gauge bar to slide past the worktable edge without interference. A 14" wide roller top (also included) coverts the adjustable stand for use as a roller stand, when desired. Perfect for ripping long boards or large panels, drilling, shaping, disc sanding or performing almost any operation on difficult-to-handle stock. Can also be used with Mark 7 or Mark V (models 510 or 520) floating extension tables.